Diet and manic depression are closely related. 1. Avoid/minimize alcohol, caffeine, and sugar. 2. Take PROVEN bipolar dietary supplements, especially omega-3 (fish oil), and folic acid. 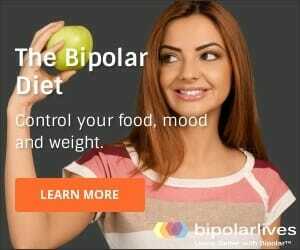 Searching for the optimal bipolar diet? Sometimes it seems like nobody wants to take their medication, and everybody is searching for a natural alternative. However, unfortunately there is a lot of Internet snake oil and unreliable information out there. Do click the links above and discover some facts about diet and manic depression. Don’t risk your health with unproven and untested products when there are already excellent, well researched alternatives you can explore. Please remember, food is NOT love. 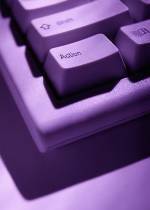 There is a toolbox of bipolar recovery aids available to you, many of which you can learn about on this site. A healthy balanced diet is important. The 3 supplements inositol, folic acid and fish oil can all help you. However, always keep in mind that food is not love, and that the wrong choices can really undermine your health. Make choices that support your mental and physical health and learn all you can about diet and manic depression. 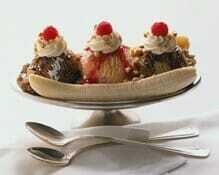 Food is NOT love – and that banana split is not an answer to anything! There is no doubt that your food will influence your mood. Any credible book or website will give you the same advice for stabilizing your mood – cut down on caffeine, sugar, alcohol and chocolate, and eat more vegetables, drink more water, and include more oil-rich fish and whole grains. This is the one paragraph crash course on diet and manic depression! Some good further reading includes Food and Mood from the Depression and Bipolar Support Alliance (DBSA). There is also interesting research available on supplementing with a general mix of vitamins and minerals. The results of one trial showed that for those bipolar patients who completed the minimum 6 month open trial, symptom reduction ranged from 55% to 66% on the outcome measures. Further, their need for psychotropic medications decreased by more than 50%. The researchers concluded that some cases of bipolar illness may be helped by nutritional supplementation. Many people who take medication gain weight, leading to serious health and self-esteem issues. I have struggled with this nightmare myself, and I know what a big problem it is. Like many, I have even been non-compliant with my medication for fear of getting fatter – with disastrous results! For me, weight gain is the hardest issue in diet and manic depression. 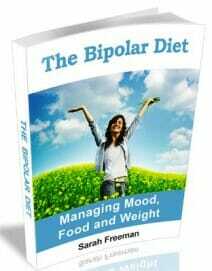 Through much research, experience, and sheer trial I developed my effective Bipolar Diet. I am happy to say it successfully controls my weight AND my moods! 1. How our stress leads to cravings. This is so we can anticipate the cravings and have healthier foods on hand to satisfy the cravings and relieve stress. 2. What foods seem to cause mood swings? If something looks like it could be a problem, then eliminate it for a week and see if there is an improvement. Sounds like a lot of work, doesn’t it? I can already feel you switching off. Please stick with me on this. It is not as much trouble as it sounds. My secret for making myself do this was to incorporate it into my Bipolar Mood Chart. It takes just a few minutes a day and IS SO WORTH IT! Mood Charts are my number one life-saver. You will be amazed at how quickly you pick out the patterns and how much easier it makes it to change. Mood Charts are much quicker to fill in than most people think and are an incredibly powerful tool. Take this action step and put yourself in the driver’s seat. I promise you that the effort of keeping a Bipolar Mood Chart is small, but the results are HUGE in terms of discovering the real secrets of diet and manic depression. I would suggest not only eating healthy but making healthy moral choices. As someone who has struggled with bipolar type 2 for decades, i have found that i am sensitive to everything. If i eat animal meat i cannot ignore that i am eating a creature that most likely feels pain and was raised to be food. This is not how i would like to be treated so it always made me feel guilt for buying and eating meat. Thus by not continuing that practice and focusing on plant based nutrition, i have further contributed positively to my mental well being along with the physical. I have been vegan now for 6 months and it is worth it 100 percent. I am diagnosed with ptsd, bipolar, and i am recovering from a 17 year opiate addiction. I do not take any pharmaceutical. In January 2 i will 1 year clean from opiates and heroin. Its a combo of spirituality,exercise, and an almost vegan diet. Learn about the vagus nerve. You basically have to detox mind body and spirit. Learn then put into action what you have learned, repeat over and over to get nuroplasticity.